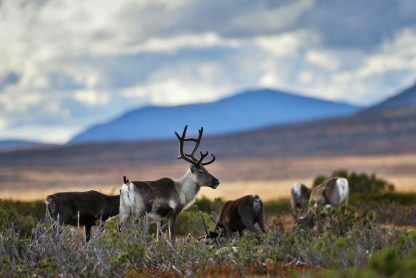 Join senior Jivamukti yoga teacher Emma Henry in the remote far north of Swedish Lapland at one of our most spectacular yoga retreat locations. 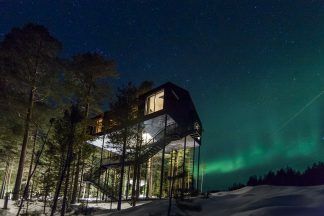 You’ll sleep in sophisticated treehouses designed by Scandinavia’s foremost architects, nestled high up in the trees of a beautiful pine forest. 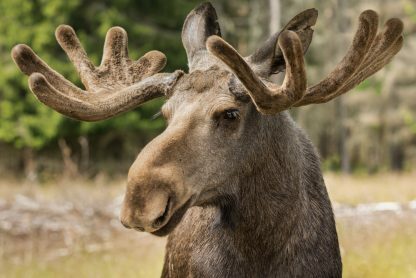 Combine dynamic yoga with options to hike, forage and ride in the forests, relax in a treehouse sauna, try a moose safari or kayak on the River Lule. 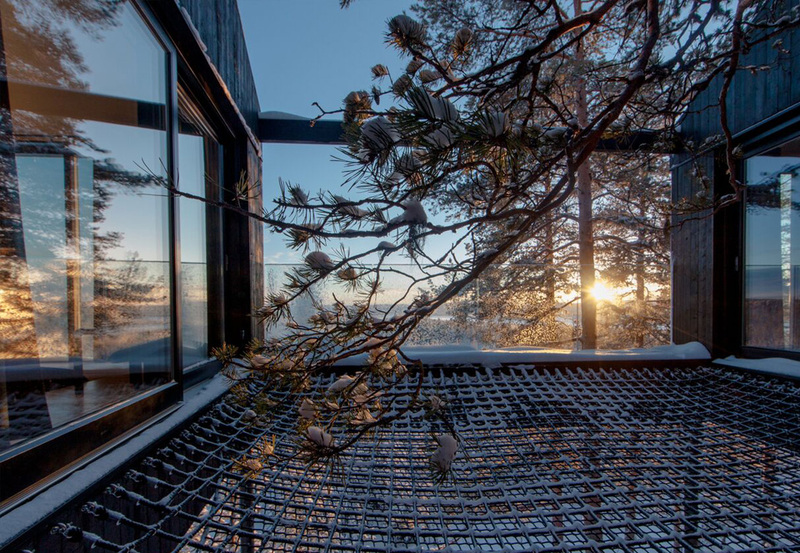 We have teamed up with Treehotel to create an exclusive and breathtaking yoga retreat in the treetops. 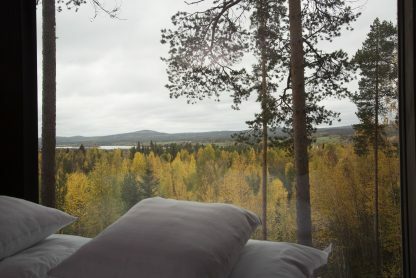 Located in a remote and beautiful wild forest, this is a place to experience a rare stillness and silence while you savour expansive views from your stylish accommodation. 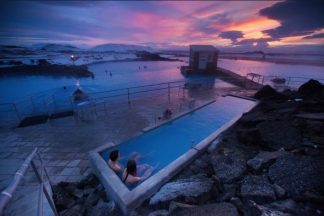 October is an excellent time to see the Northern Lights and this is pretty much the perfect place to enjoy them. Your retreat includes unlimited time in the treehouse sauna, outdoor jacuzzi and relaxation rooms. You can add a hike with a local guide exploring the surrounding meadows and forests or opt to go horse riding, head out with a guide to find local moose or kayak on the Lule river. 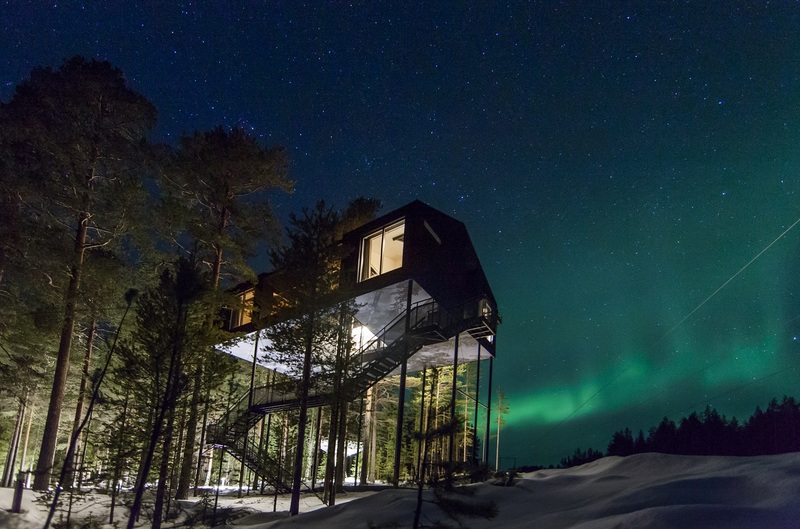 Our treehouse retreat is set to be one of our most exciting yoga retreats in Europe. Senior Jivamukti teacher Emma Henry will teach 15 hours of yoga. Morning classes will be 2 hours where you’ll experience a strong Jivamukti yoga practice. Afternoon sessions will be 90 minutes. Each Jivamukti class offers a dynamic asana practice infused with inspiring teachings derived from the ancient yogic texts. Classes include chanting, breath awareness, flowing vinyasa sequences, alignment exploration, hands-on assistance, relaxation and meditation. Emma is one of the top Jivamukti teachers so you can be sure of feeling challenged and inspired to safely explore and deepen your yoga practice on this retreat. Modifications and progressions are given so that everyone will find these yoga classes rewarding but we do recommend you have previous experience of a dynamic class and enjoy being challenged. It is a yoga style that will require you to commit to your classes. Read more about Jivamukti yoga and try a free online class here. 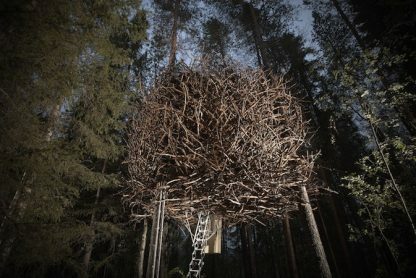 We have accommodation for 16 people in 7 completely unique treehouses and a traditional Swedish guesthouse. 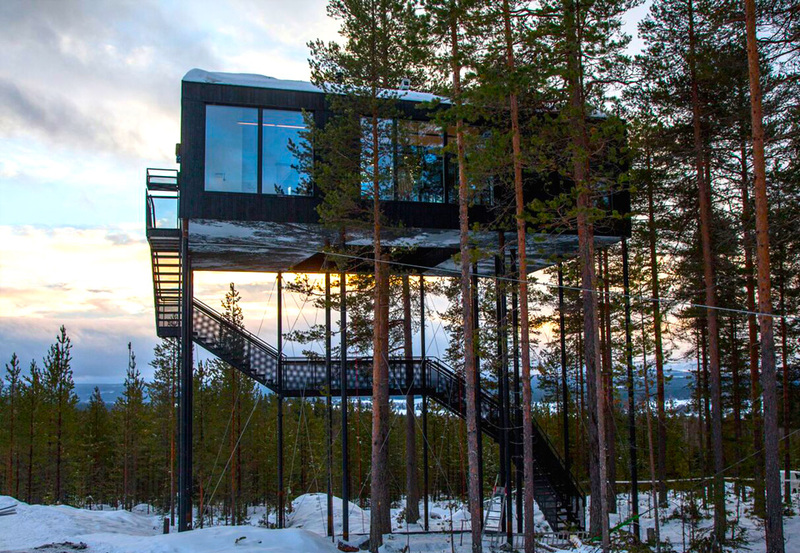 The treehouses are reached by ramp, bridge or electric stairs. 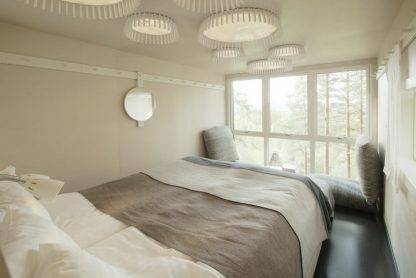 Each has contemporary interiors, cosy bedrooms, a bathroom with a sink and toilet. Showers are located in the treehouse sauna nearby, apart from the Dragonfly and Seventh room treehouse which have their own shower. We also have 4 rooms in the guest house for those who want to savour the beautiful location at ground level! The Bird’s nest is a treehouse within a gigantic bird’s nest! 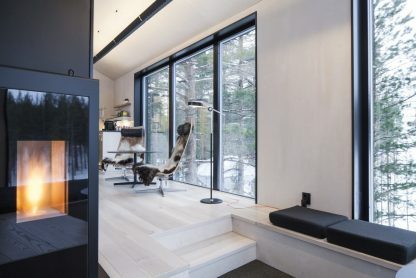 It has two private rooms, a small lounge area and toilet. Showers are located in two separate buildings close by. 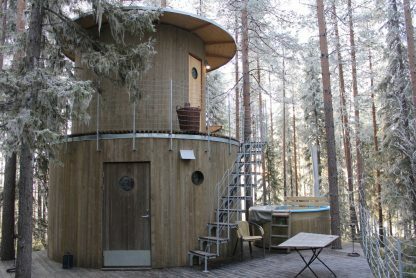 The UFO – is an uber comfortable treehouse comprising of a large round room with a double bed, separate toilet and living area. Showers are located in two separate buildings close by. 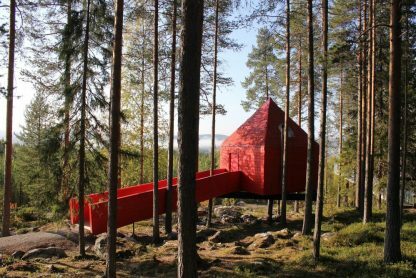 The Red House is a traditional wooden structure set on the edge of forest with incredible views over the valley. The treehouse is 22m² and has one bed downstairs and a further two beds in a separate sleeping loft. It also has a cosy living room and a toilet. Showers are located in two separate buildings close by. 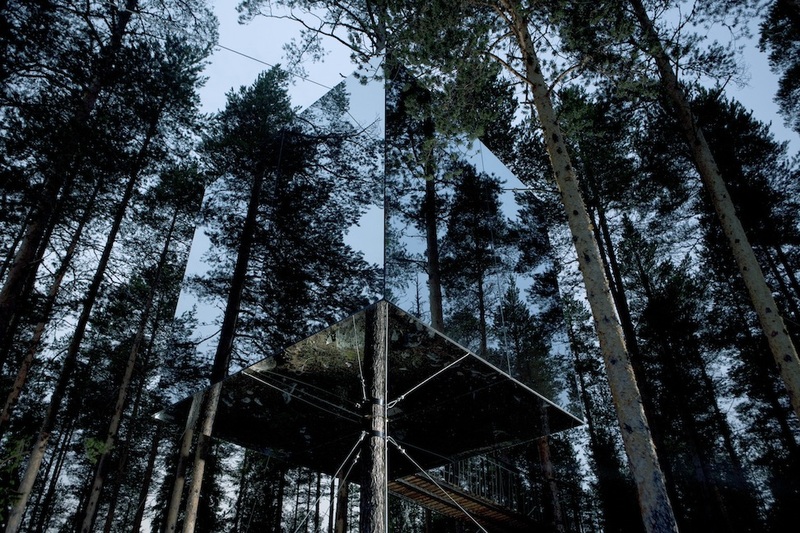 The Mirrorcube is an exciting hide-out among the trees, camouflaged by mirrored walls reflecting their surroundings. 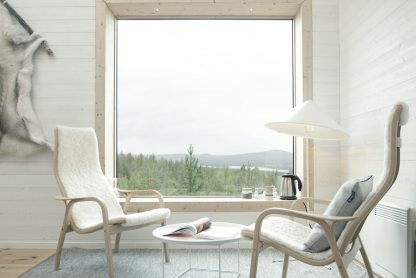 The six windows provide a stunning panoramic view. It has a double bed, lounge and toilet. Showers are located in two separate buildings close by. The Cabin is like a capsule in the trees located high up on a sharp hillside overlooking the Lule River valley. 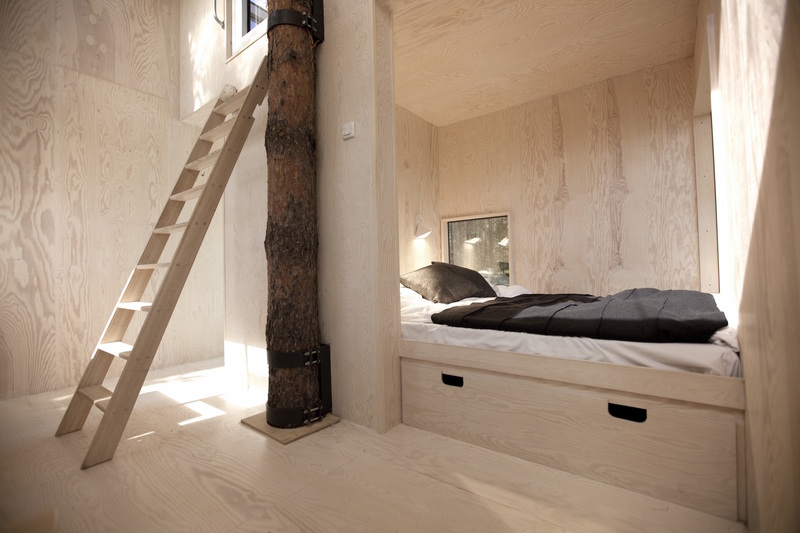 It has a double bed, lounge area and toilet and a rooftop terrace. Showers are located in two separate buildings close by. 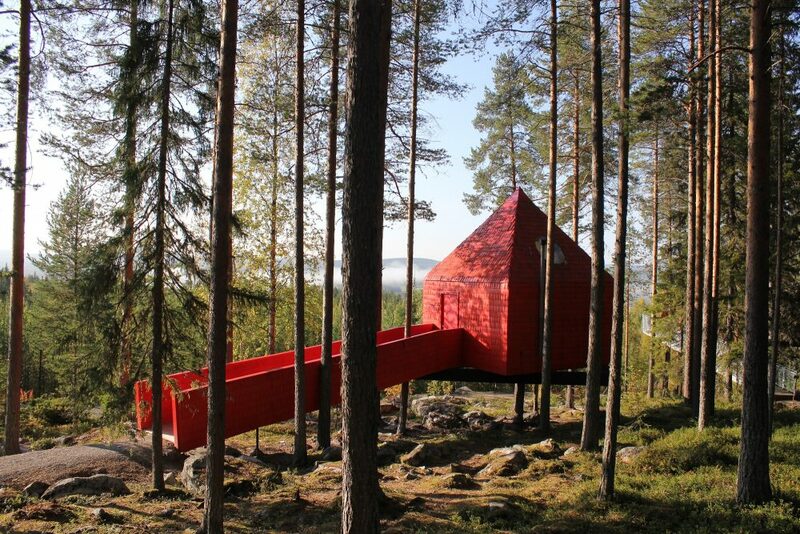 The Seventh room is a large treehouse located ten metres up in the pines. It has one private room with a double bed and one twin with two single beds, a lounge, a net patio and a bathroom with toilet and shower. The Dragonfly is our largest treehouse mounted six metres above ground on hundred year old pine with magnificent view of the valley. It has one private room with a double bed and one twin with two single beds, a lounge and a bathroom with toilet and shower. 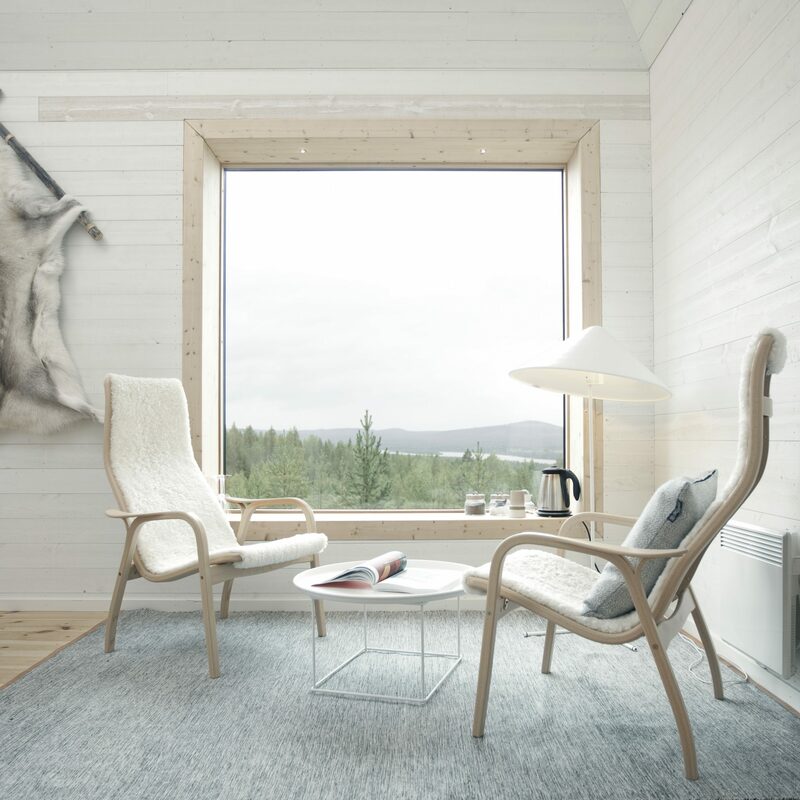 The Guesthouse rooms are in a traditional Swedish farmhouse surrounded by beautiful nature. The large wooden house looks out over the valley and has 4 quaint and comfortable bedrooms and 2 lounges on the top floor. One room has an ensuite bathroom and the other share bathrooms and separate toilets. Downstairs is a cosy front room with a fireplace, along with the group dining area and kitchen. 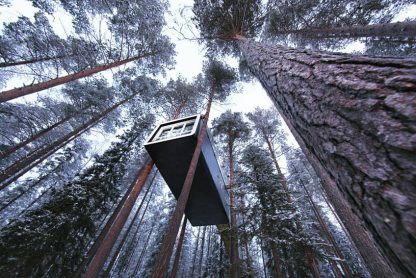 While you wont be sleeping up in the trees you’ll be enjoying the incredible forest location, the treehouse spa and amenities. Your meals will be created by local chef Sebastian Gröndal and served in our warm and homely dining room. With his passion for food and for sourcing the very best local produce, Sebastian is known for creating a wonderful variety of unique and delicious dishes. You’ll be served 3 hearty plant-based meals a day. The menu will include dishes made with locally sourced wild herbs and spices and local berries. 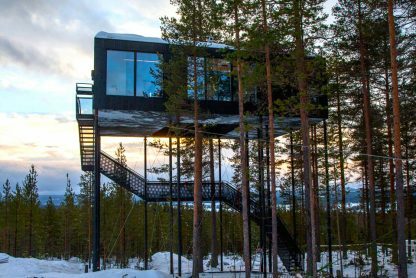 Treehotel is near Harads, 100 km from Luleå airport which is 70 minute flight from Stockholm. We start at 4pm on 23rd October and ends at 10.30am on 28th October. 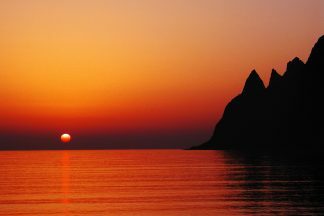 You can fly to Luleå via Stockholm with Norwegian Air and SAS. Fares are from £175-£300 if you book in advance. 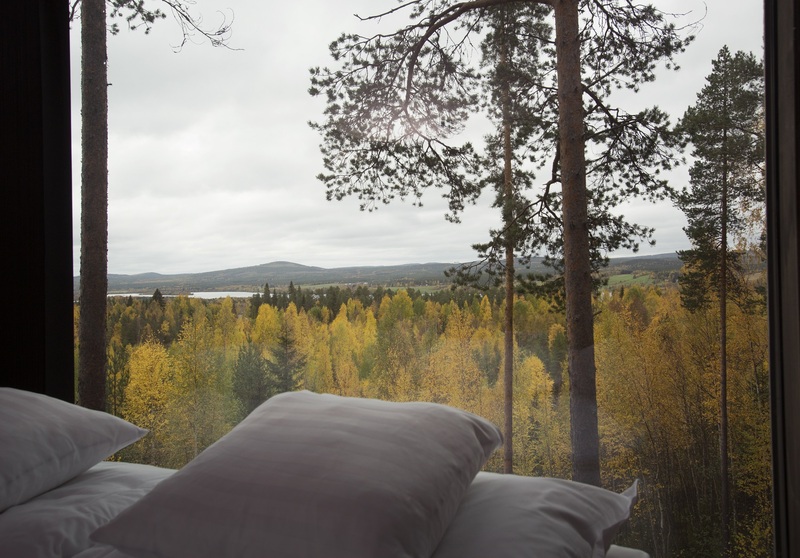 Airport transfers to and from Luleå airport are included in your retreat package. We will send you pick up and drop times when you you book.